When it comes to booking photographers for your wedding, are 2 always better than 1? Let us show you some images to demonstrate these points. Often in wedding ceremonies, the registrar or minister requests that the photographers keep still. It seems that the movement is more distracting than the occasional click of a shutter. So in our case, Richard often stands near the front of the ceremony and Sarah stays at the back. So there are times when the couple are facing Richard and others when they are facing Sarah or side on to Sarah. The following 2 photos illustrate this point. 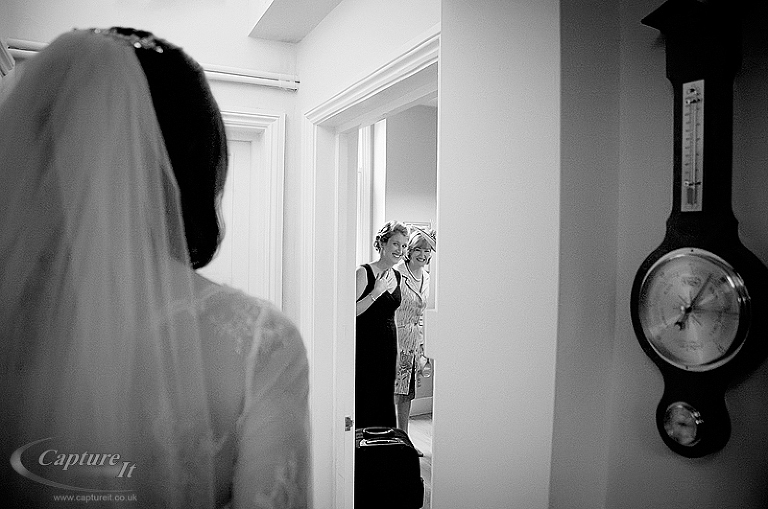 In Sarah’s shot the bride pretends to check with a bridesmaid that she’s doing the right thing in getting married. 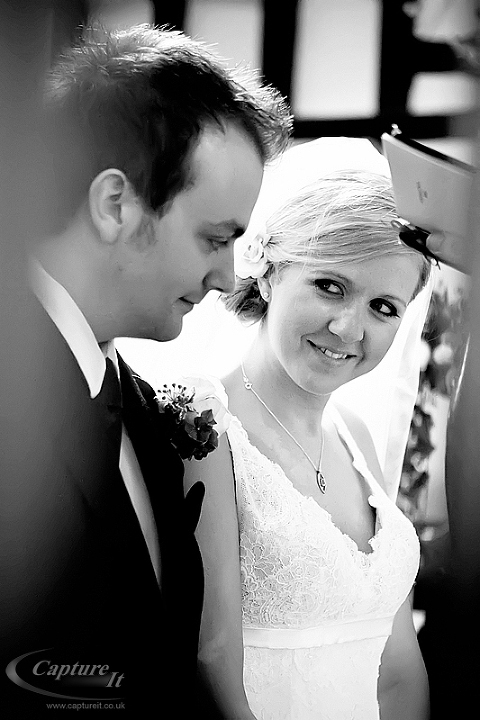 In Richard’s shot, the bride shares an intimate glance with her husband. She knows she’s done the right thing. These are 2 photographs that both show fleeting moments less than a minute apart. It would have been impossible for a single photographer to be in both places to capture both of these moments. Richard grew up taking landscape photographs. So frequently he will be the one to capture the wonderful setting or wedding venue. On the other hand, Richard freely admits that he’s never worn any dress let alone a beautiful wedding dress. Sarah, however, knows the joy of being a bride and knows the emotions and moments that have meaning for a bride on her wedding day. That’s why our photos often demonstrate our areas of interest or expertise. Both are essential to capture the full story of a wedding day. Even though we have our own backgrounds and main interests in wedding photography, that doesn’t mean that we can’t take any other kind of photo. In fact, creatively we spark off of one another and inspire one another. Take a look at the following landscape photograph from Sarah and bridal shot from Richard. Getting ready is part of the story of the wedding day. So it’s really good that Sarah can be with the bride while Richard is with the guys; making sure we capture both sides of the story. It’s quite deliberate that we have different lenses from each other. We go for different compositions of the same scene. This means that when taking photos of just the bride and groom, for example, we can get a context shot at the same time as getting a close up or portrait. Typically we spend about 20 minutes with the couple for their portraits. In comparison, we know of another leading wedding photographer that takes about 3 hours shooting the couple in various locations. Unsurprisingly, he says that his couples are pretty sick of him by the end of the day. We know that our couples appreciate having time to spend with their guests as well as great photographs. We love being wedding photographers. We really enjoy working together and working with our clients. Contact us to arrange a portfolio and we can show you more of our photographs that capture the full story of a wedding day. Diana - I agree with you, if the couple can afford it, it is best to capture every important moment of their wedding and the best way to do it is to have more than one photographer. 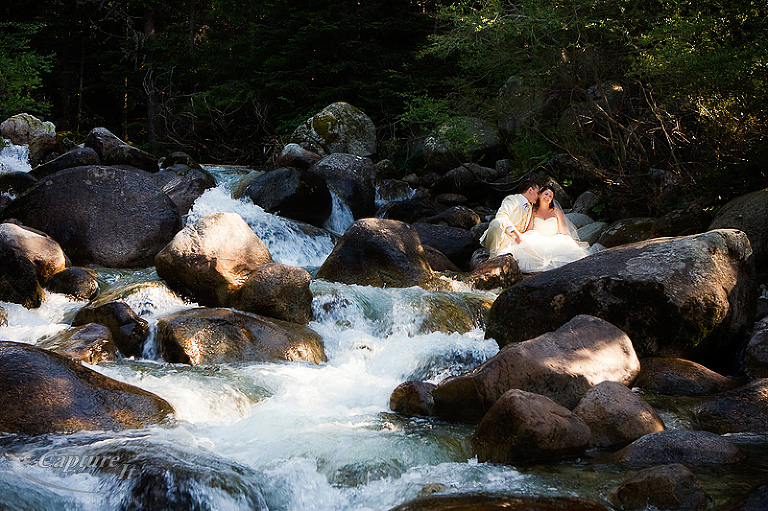 I love the photo of the couple on the rock, Richard did a good job capturing the flow of water.